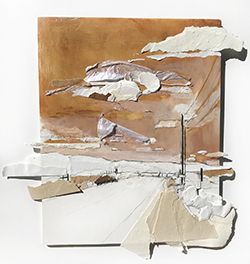 For this exhibit, three artists, Norma Alonzo, Ann Johnston, and Meghan Wilbar, share their unique interpretations of the landscape around them. 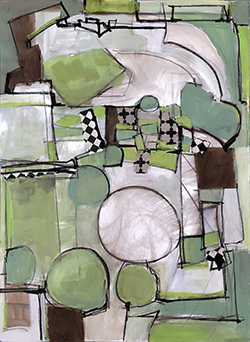 Norma Alonzo of Santa Fe, New Mexico, paints landscapes as an exploration and expression of the feeling, and perhaps the understanding to our state of being. Her paintings reflect this push and pull, back and forth between opposites. This tension and energy accompany hope, balance and peace through structure, space and color. Ann Johnston of Lake Oswego, Oregon, shares quilts from her body of work The Contact: Sierra Nevada, Dyed and Stitched. 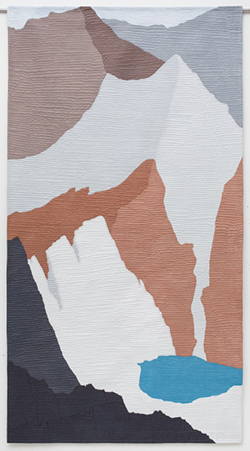 These works explore the sunlit white granite peaks as well as the dark mines and machinery of the California Gold Rush of which Ann is a descendant. Her quilts explore her life-long connection to and exploration of this landscape. Meghan Wilbar of Pueblo, Colorado, explores the sky. She feels the color, shapes and movement of the sky alter our sense of being and understanding of the world. Her pieces investigate this connection between the observational and emotional view of the sky. Shown are both collage studies completed on location and sky/land paintings. In the lobby, we continue our celebration of the Lincoln Center's 40th Anniversary with a display of items from the Fort Collins Museum of Discovery Archive, sharing the Lincoln Center's history.